Northern lights and the boreal forest in Wrangell – St. Elias National Park, Alaska. The northern lights are Alaska’s pride and joy. Photographing the northern lights is a treat, but one that definitely becomes easier with some practice. This northern lights photo tour is designed to put you in the right places at the right time for the best photography results. We’ll base ourselves comfortably in Fairbanks, central Alaska, and possibly one of the very best locations in the world for northern lights viewing and photography. We’ll have the mobility to head out in virtually any direction to shoot the northern lights; north on the Dalton highway towards the Arctic Circle and the Brooks Range, east towards the 40 Mile Area, south towards Denali National Park and the Alaska Range. Northern lights photography is tough; it requires practice and experience, and knowledge of where to go when. The benefit of a local guide is immeasurable; scouting and planning make shooting that much easier in the dark and cold of an Alaska winter. Why this tour? Flexible, experienced and knowledgable northern lights photo tour leader, and a perfect centralized base to work from make this one of Alaska’s premiere northern lights photo tours. This is not a northern lights viewing tour; we’re there to photograph the aurora, and we’ll make every effort to be in the absolute best locations when the displays peak. 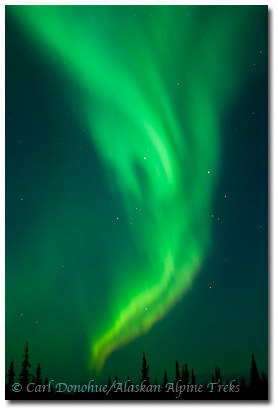 That means long hours sometimes; for the serious photographer, this is how to shoot the aurora borealis. Here is my comprehensive guide to northern lights photography, which I think you might find to be helpful preparation. What’s included? All accommodation and travel. You’ll need to arrive in Fairbanks. We’ll meet there, and then spend 6 days shooting the northern lights and classic Alaska winter landscape photography. Meals are not included, but eat well, most assuredly. For a complete look at this tour and all the details you might need, please visit my Expeditions Alaska northern lights photo tour page. If you’d like to discuss the tour, let me know what your photography goals and interests are, drop me an email or give me a call at 770. 952 4549. A few northern lights photos from previous trips.